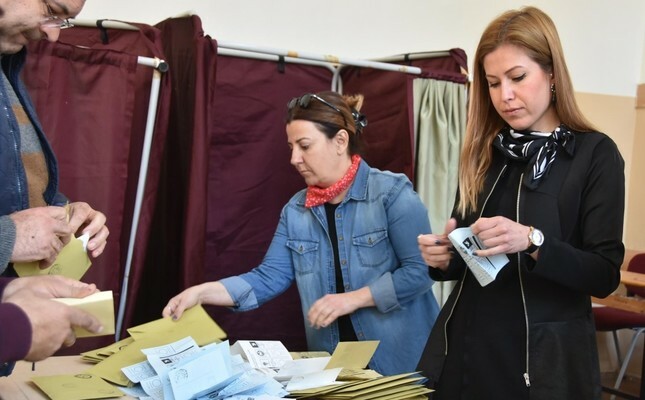 Votes have been recounted in many disticrts of Turkey following speculations about the March 31 local elections, including İzmir's Bergama, April 8, 2019. Ten days after Election Day and with three days left to the deadline of the objection period, election discussions riddled with violations and controversy took a new turn after the ruling Justice and Development Party (AK Party) called for a re-do of the elections in Istanbul. Speaking to Habertürk TV, the Nationalist Movement Party (MHP), which is an ally of AK Party, Deputy Secretary-General Mustafa Kalaycı underscored that a do-over election is among the options for the districts of Istanbul where irregularities are common. Pointing out that the election process does not only consist of the voting day but also the subsequent objection processes, he emphasized that everyone should respect this natural process and Turkey's Supreme Election Council's (YSK) decision on the relevant objections. He noted that everybody should keep in mind that each political party has the right to object to the provisional election results. Touching upon the remarks of his party leader Devlet Bahçeli, Kalaycı highlighted that instead of a do-over election in the Istanbul province, the new election may be held in certain districts of the city. "The decrease in votes between the two candidates points to a problem and raises doubts," he added. The AK Party declared on Tuesday that they will seek to use the right to make an extraordinary objection and demand a repeat of the election. The MHP also supported the call of their ally, saying that if the elections resulted in a way that does not satisfy the public conscience, holding a new election may be considered. President Recep Tayyip Erdoğan raised concerns about "organized interference" in the Istanbul elections earlier Monday. "We, as a political party, have detected organized crime and some organized activities," Erdoğan told reporters ahead of his departure from Istanbul for Moscow. Deputy Chairman Seyit Torun also told Habertürk yesterday that if YSK decides to re-do the elections, it proves that the council had become politicized which eventually will undermine the trust in the institution. He emphasized that in case of such a decision, they will refer to legal remedies to stand up for their rights. Meanwhile, AK Party spokesperson Ömer Çelik said yesterday that the 28th AK Party Consultation and Assessment Meeting will be held in the Kızılcahamam district of Ankara between the dates of 26-28 April. Çelik also added that President Erdoğan gave instructions to all branches and units of the AK Party to make the necessary efforts to completely understand the messages that citizens gave in the elections. Çelik stressed that the YSK makes its decisions in a completely free environment and opposition parties should give up their efforts to put pressure on the YSK and media.